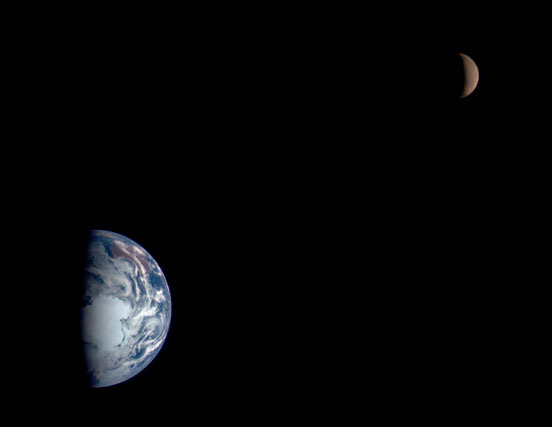 The Earth-Moon system via NASA. Of course, this isn’t how things really are. In reality, our night sky is in a constant state of flux. Most of you have probably heard that the relationship between the Earth and Moon is a little…unstable (for lack of a better term). Although the Moon seems nice and reliable, I’m afraid that the rumors are true — the Earth and Moon are drifting apart. Each day, the Moon is slowly getting farther and farther away. It is increasing its orbit and moving away from us at a rate of 1.5 inches a year (4 cm). True, it is a bit unsettling. However, I’ve heard a lot of people blowing this out of proportion. You see, there are a number of individuals who believe that the Moon is leaving for good (hopefully, you never believed these slanderous lies, but a lot of people do). Individuals frequently talk about a permanent breakup. And this, I am glad to say, is utter nonsense. As is true of many rocky relationships, the Earth and Moon only need a bit of time and space to work things out. Ultimately, we just need to be patient. In about 50 billion years, the Moon will stop moving away from us and settle into a nice, stable orbit. At this point, the Moon will take about 47 days to go around the Earth (currently, it takes a little over 27 days). When this new stability is achieved, the Earth and the Moon will be tidally locked to each other. As a result, it will look like the Moon is always in the same spot in the sky — so our relationship will seem more stable than ever! …of course, the Sun is going to turn into a Red Giant in about 5 billion years, and many scientists believe that it will consume our planet in the process. So the Earth and Moon will be obliterated long before they achieve stability…and the human race will probably be extinct. But we all may be churning together beneath the searing surface of our Sun, together at last. It is kind of a beautiful thought…kind of.